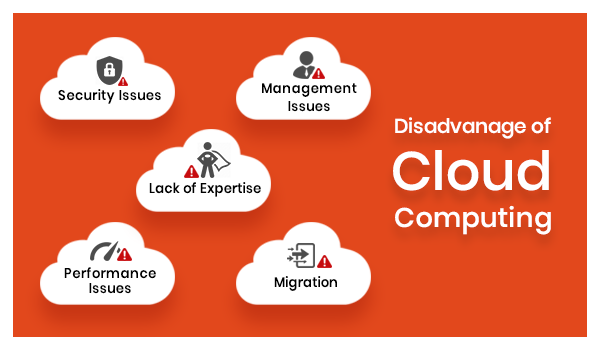 Disadvantages of Cloud Computing | Know How To Avoid Them? Cloud computing became popular because of the numerous advantages it offers. The flexibility of the service, the mobility it provides, the ease of access that users enjoy are just some of the basic features of cloud computing. Despite these numerous advantages, companies are still hesitant to adopt cloud computing into their system and take advantage of its perks. Unfortunately, there is another side of the coin: cloud computing is not too good to be true because the disadvantages of cloud computing are as real as its best features. As early as its launch, cloud computing raised worries about potential security threats among enterprises. This is one of the disadvantages of cloud computing that, until now, is not resolved. Even cybersecurity experts are confirming that this concern is valid as they pinpoint the issues of data loss and leakage, data privacy and breaches of confidentiality. Though security is the top notch among the disadvantages of cloud computing, this remains a struggle only for beginners in using the cloud, while intermediate and advanced users are more concerned with cloud expenses than security. Among other disadvantages of cloud computing, security issues became a benefit instead of a struggle to cloud computing users. Cloud security became part of the solutions that cloud vendors offer. Also, this threat led to the allocation of budget for training and certification of IT personnel and security tools to counter the possible risks in cloud computing. Once a business has overcome the issues of security, one of the most challenging task in maintaining cloud computing services are the expenses. Managing cloud spending is the top issue among disadvantages of cloud computing for advanced users of cloud. An estimate of 30% is wasted on cloud services due to two major issues: mistakes of organizations that drive up the costs and cloud pricing schemes that organizations fail to utilize. The problem here is clear: if the organization is capable of managing the services available, you can get the value for your money and maximize the benefits that you paid for. Also, managing the cost can be dealt with by automation, containers, serverless services, autoscaling and other management tools offered by cloud vendors. Again, one of the disadvantages of cloud computing is turned into another cloud computing solution. Cloud computing requires capable personnel in order to manage the system. The lack of expertise of these staff indirectly leads to two major problems: security and cost management issues. Among the disadvantages of cloud computing, lack of expertise is an issue when solved, can lessen the problems of security and unnecessary expenses. This can be done through constant training and certification of personnel in order to keep them updated with the latest developments in the system they are entrusted with. Developing a team of technological experts instead of mere technological workers can aid the problems that arise out of lack of expertise. The more complex the technology becomes, the more your business should invest in the capability of your IT team. One of the disadvantages of cloud computing is making a company dependent on service providers. This means that if the cloud server is down, it would be the same for your business. All the cloud-based system of the organization is tied to however the server performs. Outages in recent years became a performance problem that made businesses think twice before adopting cloud computing. When your business experiences a computer outage, that means revenue loss, which is a big setback to any entrepreneur. There could also be problems with real-time monitoring due to the lack of control that comes with cloud computing. Handing over the control of the performance of your business to cloud is a very risky decision, but it can be countered by the right processes in case of outages. If your service provider can ensure a process that can protect your interest as a client, then that is a promising cloud computing offer despite the inherent disadvantages of cloud computing as regards performance. Another concern about cloud computing is its migration. Migration issues became one of the disadvantages of cloud computing because of its difficulty when existing applications are moved into a cloud-based environment. The migration takes more time than usual because of troubleshooting, the difficulty of security configuration, slow migration of data, troubles with migration tools, data sync problems, and downtime during migration. Thus, the process exceeds the allocated budget. This is a major concern especially for companies who have existing accounts in a different service and want to expand with the use of cloud computing. New applications do not have the same problem. It is just a breeze compared to the migration process of existing ones. So, IT leaders can lessen the setback by planning a longer project timeline, performing pre-migration tests, hiring an expert and increasing their budget. With these prepared, the disadvantages of cloud computing during migration can be mitigated.